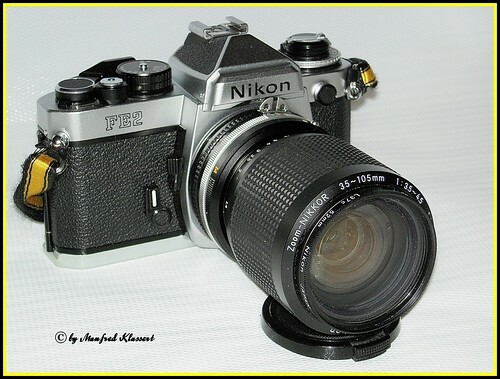 The Nikon FE2 is a 35mm SLR from Nikon launched in 1983 as the successor to the Nikon FE. It was manufactured until 1987. Two main models exist, an entirely black one and one featuring a silver top and bottom plate. In 2001, Nikon launched the Nikon FM3A as the successor to this camera as well as the Nikon FM2. Unlike the Nikon FE, the Nikon FE2 cannot use non-Ai Nikkor lenses because the Ai prong cannot be flipped up. Most Ai-type Nikkor lenses, as well as Autofocus Nikkors up to, but not including the "G" series of lenses, will work with the Nikon FE2. An improvement over the previous model was the use of a silicon photo diode light meter. The viewfinder information also got an update with a dedicated LED (+/-) when exposure correction is switched on. The Nikon FE2 was the first camera to feature a minimum flash sync speed of 1/250th of a second. This is possible because of the advanced Titanium shutter, with speeds from 8 seconds to 1/4000th of a second (actually in "A" mode the FE2 can expose much longer than 8 seconds). The film speed needs to be set manually using the wheel on the top left of the camera as the DX-system is not supported. 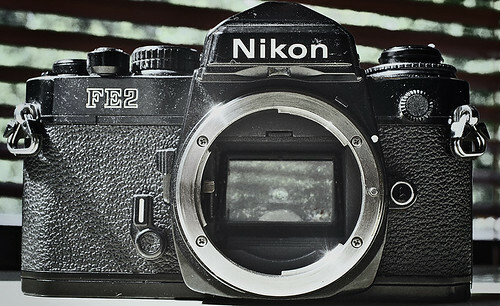 Similar to most Nikon models from the period, the FE2 features the 60/40 integral metering system. Initially Nikon planned to use the new matrix system, which was then under development in the FE2, but it was not ready on time and therefore was first installed on the Nikon FA. The Nikon FE2 has only a few bells and whistles, but it is extremely well built and therefore still sought after today (2010) by users. Just two feature,; which are both related to the self-timer lever are the only ones which are not immediately obvious. Pushing the lever towards the lens functions as the AE exposure lock. If the self-timer is enabled (which when fully engaged takes 10 seconds to release the shutter), the mirror flips up immediately after pushing the shutter button, thus minimizing vibration during the exposure. The FE2 is equipped with TTL OTF flash. Most Nikon flashes with TTL capability are supported, with the notable exception of the Nikon SB-900, which is only capable of iTTL OTF functionality. The only 35mm film camera which supports iTTL OTF is the Nikon F6. Being an "automatic" camera, the Nikon FE2 is equipped with an exposure compensation wheel, which allows compensation from EV -2 to EV +2. The shutter of the Nikon FE2 is electronically controlled. In case of battery failure the 1/250th of a second shutter speed can be used in mechanical mode. The accessories for the Nikon FE2 are the same as for the other members of the Nikon FE and FM camera series, including the most recent model Nikon FM3A. The motor winder Nikon MD-12 is probably the longest manufactured accessory in the entire history of Nikon. The winder MD-11 also works with the FE2. Two data backs were available, the MF-12 and the MF-16, whereas the latter one does not need a special cable to function, but uses the contacts in the camera body instead. Both of these data backs can only imprint data within the visible area of the negative and have a very simple feature set. Several focusing screens (of the type 2) were available for the FE2, the most notable being the "E2" screen, which features grid lines. Interestingly, the regular back for the Nikon FM3A can still be used on the Nikon FE2. This provides a window through which the film type can be read off the cartridge. By now this camera model is over 20 years old. Nikon service doesn't repair this model any longer, but there are still some independent repair shops, which do. As the FE2 features several electronic components, it is prone to failure. A typical sign of an electronic component failing is the "jittery needle" syndrome. If the match needle in the viewfinder begins to "jump" erratically after the shutter button has been depressed half way, the camera is about to fail. Another typical sign is the intermittent failure to complete an exposure in "A"-mode, which is indicated by the mirror failing to return to the viewing position. In these cases, the camera has to be serviced and some electronic components might need to be replaced. A fully functional Nikon FE2 is still a very capable camera. One advantage over the Nikon FM3A is the fact that the match needle display reaches to 8 seconds in the FE2 vs. 4 seconds in the FM3A. The Nikon FG had a similar feature set, when compared to the Nikon FE2, in a slightly smaller package, but lacks the Depth of Field preview button and exchangeable screens of the FE2. Being smaller, the Nikon FG accessories are also not compatible with the FM and FE series of cameras. This page was last edited on 30 November 2018, at 05:06.